With NASA's shuttle program coming to an end, its fleet of shuttles will be going to new homes. Kennedy Space Center, Florida (CNN) -- So you're in the market for a new vehicle. Any chance you'd consider one with more than 100 million miles on the odometer, a neat white paint job and a sticker price of $28.8 million? Probably not. Even if you were ready to plunk down nearly $30 million, chances are your garage can't fit a space shuttle next to the lawn mower. But there are a few places willing to pay the price. And for the most part, they've got the space, too. When the shuttle Atlantis touches down Wednesday morning (weather permitting), the orbiter will become the first of the three remaining shuttles to officially retire. By the end of the year, Discovery and Endeavour will follow. The question is: Where will they retire to? "These are unique spacecraft, and they truly are one-of-a-kind, said NASA spokesman Allard Beutel. "Each one is a little different, and they are the only reusable spacecraft in the world, ever. I can't imagine an institution ... not wanting to have it for public display," he told CNN. About two dozen museums and institutions around the country have submitted paperwork to take title on one of the most technologically advanced machines ever built -- a crown jewel for any entity which can afford one. "We're not selling them, remember. This is what it's going to cost to get it cleaned up, make it safe to display and then actually get it there," said Beutel. The price includes removal of any toxic chemicals and flying it to the nearest airport aboard the 747 shuttle transport jet. Some of the institutions vying for one of the three shuttles include the usual suspects: the Smithsonian Institution's National Air and Space Museum in Washington; the Intrepid Sea, Air and Space Museum in New York City; the privately run Kennedy Space Center Visitor Complex near the shuttle launch pads in Florida; the Johnson Space Center outside Houston, Texas; the Air Force National Museum, in Ohio; and the Adler Planetarium in Chicago, Illinois. NASA has earmarked the oldest shuttle, Discovery, for the Smithsonian, which already houses an extensive collection from the U.S. space program, including artifacts from the Mercury, Gemini and Apollo programs and Enterprise, the test shuttle. But the Air and Space Museum's entire annual budget, at $28 million, wouldn't cover NASA's asking price for Discovery, and since NASA has typically provided space artifacts at no charge, the museum has balked. "Questions about costs associated with the transfer of Discovery, which have been estimated by NASA, have not been resolved although the Museum is exploring options," the Smithsonian said in a written statement supplied to CNN. Others, however, are eager to pony up a check. "Between our cash and our loan arrangements, we could take the shuttle tomorrow and get ready to go," said Bill Moore, the chief operating officer of the Kennedy Space Center Visitor Complex. But whoever takes charge of a space shuttle not only has to pay NASA dealer prep and transportation charges, that entity will also have to build an enclosed, temperature-controlled facility to house it. "We need a wonderful building to put the shuttle in. It just demands that," said Moore. "We want to put in the artifacts. We want to tell the story of the people that serviced and got this wonderful bird ready to fly," he told CNN. The Kennedy Space Center Visitor Complex expects to draw a double digit increase in visitors yearly to see whichever shuttle they might acquire. Currently, about 1.5 million people visit each year. "We get visitors from around the world. When they see a space-flown artifact ... they get emotional about these pieces of equipment," said Moore. Up the Eastern Seaboard, the retired aircraft carrier Intrepid sits off Manhattan's west side. The mighty ship once raced across the Pacific Ocean to pick up astronauts and space capsules after splash down, and now its officials want the museum it anchors to be the new home for a space plane, too. "It's the tourist capitol of the world, and we just really feel that we want to help bring the most eyeballs that we possibly can to what is this technological masterpiece," said Susan Marenoff, executive director of the Intrepid Sea, Air and Space Museum. Marenoff says that the museum would have to move the Concord supersonic jet, currently on display, and put the shuttle in its current spot. She expects more than $106 million in economic benefit if the museum hosts one of the shuttles. "The shuttle itself just offers the opportunity for science and education programs to be brought to multicultural institutions, generations of people that will be able to come and really learn what this icon is all about," said Marenoff. 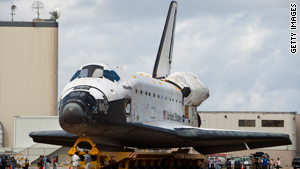 Although Atlantis will be the the first of the shuttles to end scheduled flights, the second-oldest shuttle won't be quickly shipped out to pasture. It will be prepared to make another flight, if necessary, as a future rescue mission. Of course, NASA hopes it never has to fly that mission. And when all three shuttles are safely on Earth for the last time, Atlantis, Discovery and Endeavor will be stripped down and readied for delivery in mint condition. Well, almost, said NASA's Beutel. "About as mint condition as you're going to get for a thing that has traveled over 115 million miles in a 25-year period."